Seven Russians trapped deep in the Pacific for three days have been rescued after their mini-submarine was cut free of nets it was snagged in. They were able to climb out of the vessel unaided when it resurfaced. Fears for their safety had mounted because of dwindling oxygen supplies. Military doctors were on standby to treat the men, who had also faced temperatures as low as 6C (43F). Russian officials thanked the UK team whose robot craft enabled the rescue. The vessel, trapped 190m (620 ft) down off the Kamchatka peninsula in the Russian Far East, surfaced at 1626 (0326 GMT). A senior navy official, Vladimir Pepelyayev, said all the men were in a satisfactory condition. As he came ashore, the mini-sub's commander Vyacheslav Milashevsky saluted. The Associated Press said he looked pale but walked confidently and told journalists he felt "fine". Lt Milashevsky's wife Yelena was overjoyed at the news of his safe return. "I danced. I was glad, I cried and I danced for joy," she told Russian Channel One TV. The Russians said the Priz submersible - itself a rescue vehicle - was on a training exercise when it became trapped underwater on Thursday. Initially officials said the vessel was trapped in vast fishing nets. But later reports said it was also caught up in a network of underwater antennae forming part of a military coastal surveillance system. 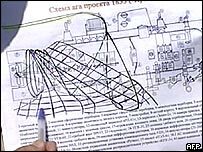 The network was described as a two-tier antennae lattice covering an area of 750 sq m.
The British Scorpio craft involved in the rescue was flown to Kamchatka and taken out to sea on a Russian vessel. The managing director of the British firm involved in the rescue - Rumic - told the BBC the operation had taken several hours. "There were a lot of fishing nets which we had to cut away, but there were no steel cables, although some of it did look like steel. Initial reports could have suggested there were steel rather than nylon nets," Roger Chapman told the BBC. "But it was a fairly long operation, with quite a lot of cutting, but eventually when most of it was freed, the submarine blew a ballast tank and came free and shot to the surface." 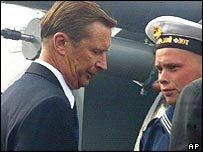 For many, this episode revived memories of the sinking of the Kursk submarine almost five years ago, when all 118 men on board died.